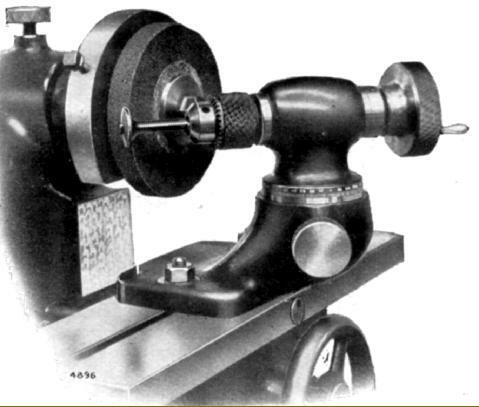 Replaced during the 1930s by the Herbert "Junior" surface grinder, the useful little "Ball-bearing Bench Surface & Die Grinder" was listed during the 1920 and intended primarily for the grinding of Coventry Die Heads and the chasers of Coventry Collapsing Taps. 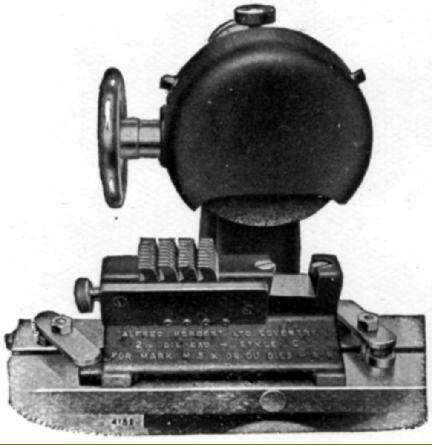 However, its handy size meant that it could be pressed into use for any number of small grinding jobs, to which end the makers offered a number of accessories including a universal, multi-swivel vice, die grinding fixture, attachment for grinding Fellows gear shaper cutters, milling cutter fixture, tilting and indexing attachment, twist-drill grinding attachment, circular knife (bacon slicing blade) attachment, a live spindle and a radial truing device. Of simple design (but sturdy construction,, it weighed 200 lbs), the main column and foot were formed as one piece and intended for mounting on a stout bench, the required minimum space being 25" x 30". The top of the column was bored through to take the grinding wheel spindle - this running in ball races enclosed in dust-proof covers and able to be moved in and out by a handwheel turning a gear that engaged with a rack cut into the underside of the spindle housing. To lock the spindle's position, a simple, direct-acting screw with a round, knurled-edged handwheel was provided on top of the column. 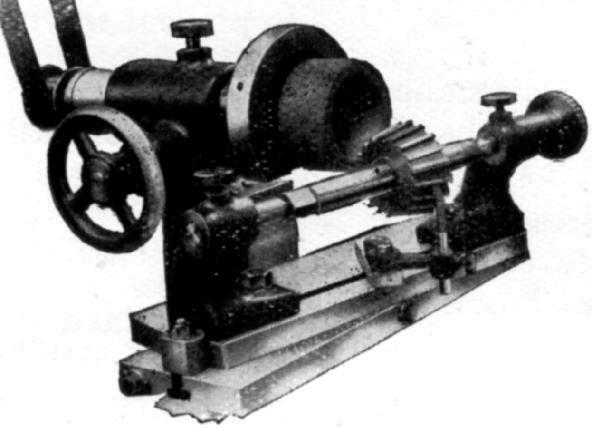 A 1.75-inch wide flanged flat pulley at the rear of the spindle was driven by a 1 h.p. 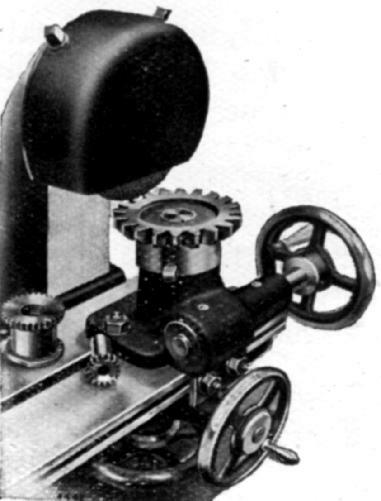 motor through a remote, ball-bearing countershaft - this assembly being fitted, in the usual way, with a fast-and-loose pulley and belt striker that allowed the motion to be started and stopped at will. However, as the spindle and pulley assembly were able to travel over a distance of some 3.625", the countershaft unit was in two parts with the upper section (intended to run at 1400 r.p.m.) having an extra wide pulley to accommodate the sliding motion of the belt. Fitted as standard was a 6" x 3/4" x 3/4" grinding wheel, this being guarded by a simple pressed-steel cover bolted to a flange mounted on the spindle housing. Machined into the face of the column was a V-edge way that carried a knee raised and lowered through its 7.125 inches of travel by a simple screw that acted directly against its underside (the maximum clearance been a 6-inch diameter grinding wheel and the table was 6.125 inches). 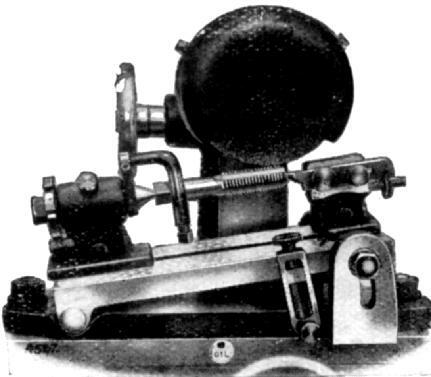 On top of the knee was a 18" x 5" table whose 10 inches of longitudinal travel was driven by rack-and-pinion gearing under the control of a forward-facing handwheel. To adjust out play between the table and its ways, a tapered gib strip was provided while T-slots were limited to just one, centrally positioned and 7/16" wide. Stops were fitted, to left and right, that acted to both limit the travel needed by a job and prevent the table from being run off at either end..
Jig to hold Herbert Coventry Die Head Dies. The dies (threaded inserts used in the heads) were clamped in the fixture using a slot that aligned them correctly. The cutting face could also be ground, an inclination at the bottom of the slot automatically putting them into the correct position. Dies that required extra top rake were ground in the same fixture - but with the latter fitted to an inclined baseplate. A similar baseplate was used when a greater or lesser angle was required on the mouth of the dies. Attachment for Milling Cutters. 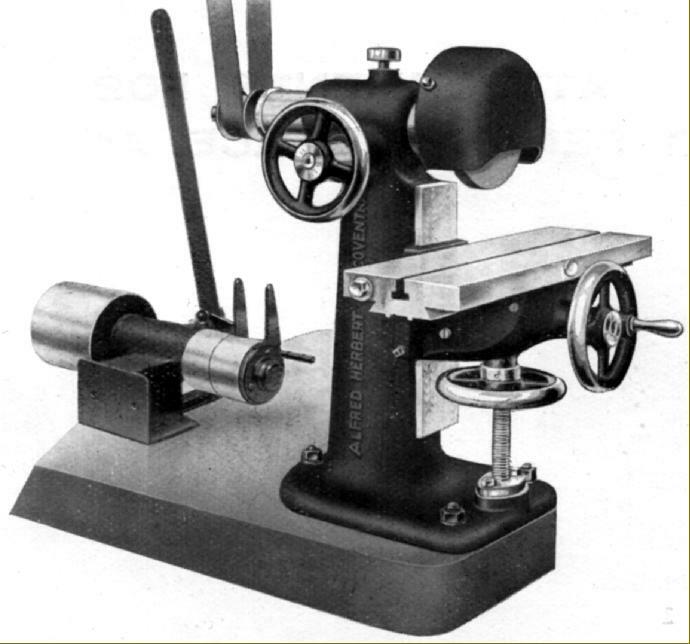 this was a complete assembly consisting of a pair of centres mounted on a swivelling table that allowed cutters with either straight or spiral teeth to be sharpened. Attachment for Grinding Fellows Gear Shaper Cutters: all types could be handled - disc, shank and hub. The spindle holding the cutter was inclined from the vertical so as to bring dished cutting edge to the correct angle. 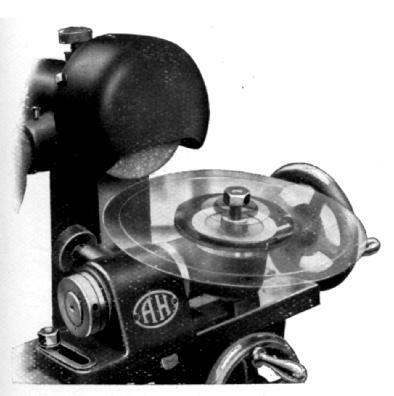 The cutter was rotated by a handwheel ,through spiral-bevel gears, and the grinding done dry using a Norton silicate 36H wheel. Tilting and Indexing Attachment: intended for the grinding of taps and reamers this accessory allowed quick indexing and allowed the job to be elevated 10° above horizontal. Work up to 6" long and 2.25" in diameter could be accommodated with, supplied as standard, an 8-slot indexing plate and other available to order. Twist-drill Grinding Attachment: able to be swivelled and tilted, the unit could hold drills 7/8" in diameter. Two V-blocks to supported the drill with the rear one adjustable for length. Live Spindle Attachment: intended primarily for the grinding of IC engine valves, this unit could also manage items such as small dead centres , Slocomb drills and punches, etc. "Circular Knife Grinding Attachment: intended to mount cutters used on bacon-slicing machines and the like, the spindle carrying the blade was rotated by a handwheel and could also be inclined to a vertical position so that any desired bevel could be formed on the cutting edge. 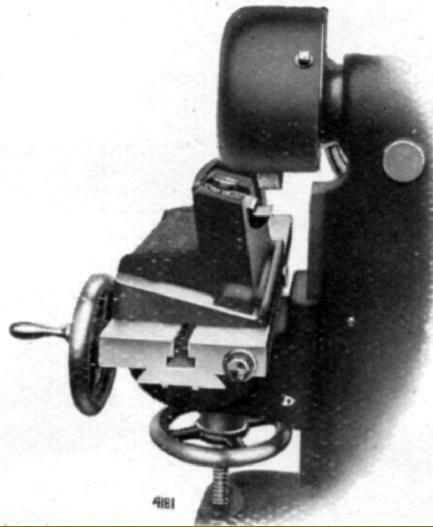 A knurled clamping screw was fitted to lock the spindle in the required position. 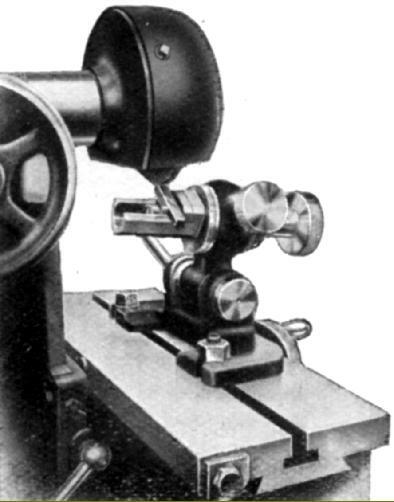 So that bladed of different diameters could be mounted, slots were provided in the baseplate to adjust the position of the fixture relative to the grinding wheel. 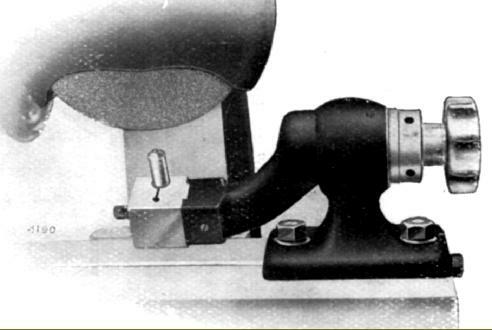 Radial Truing Device: a special diamond-tipped wheel-dressing attachment that allowed the wheel to be formed with a radius - necessary, for instance, when grinding Coventry dies with a curved lip. It was also possible, by using the diamond set past the centre of rotation, to generate a concave surface. 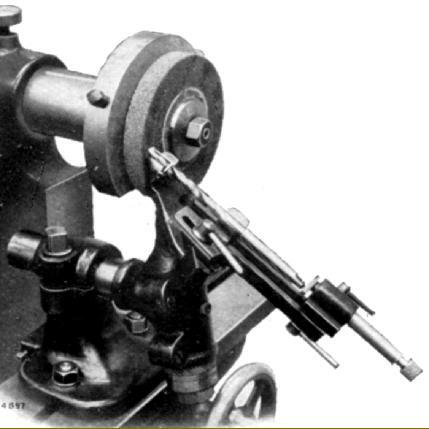 Universal Vice: capable of being set in a variety of positions and so particularly useful for grinding chasers, small tools and keys, etc., the unit had two slotted, claw-like feet with the vice proper fitted to an upper housing (able to be swivelled through 180°) carried on a horizontal trunnion.